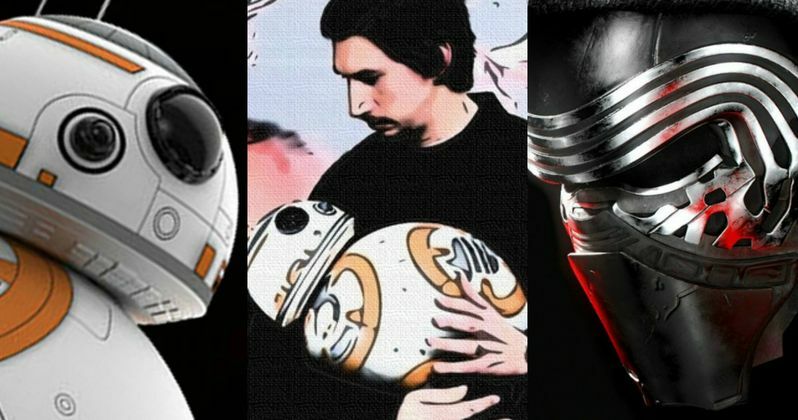 Crazy Star Wars 8 Fan Theory Reveals Kylo Ren & BB-8 Connection? YouTuber Jenny Nicholson is at it again. This time around she is not being downright funny, as she actually has come up with a pretty insane, and quite possibly correct theory about Star Wars Episode VIII that relates to BB-8 and Kylo Ren. This is your final warning for potential spoilers, because if she is right, this will have a massive effect on Episode VII and very likely Episode IX as well. Nicholson recently posted a video to her YouTube channel which is titled BB-Gate, as in "Watergate" or "Deflategate." In the video, she poses a pretty crazy, yet oddly plausible theory that Kylo Ren is actually the one who built BB-8 and explains that it will have major consequences in terms of how Episode VIII and the rest of the trilogy shakes out. Here is how she explains it. "What do we know about Kylo Ren? Well, he's Han and Leia's kid so he probably grew up around Resistance bases. He idolizes Darth Vader and does everything that Darth Vader did. So what do we know about Darth Vader? Well, he was a powerful force user, he worked for the bad guys, he wore black and a mask that made his voice really deep. Oh and when he was a kid he built droids. Okay, so I'm interested in that last one. When Poe tells Finn about BB-8 he says 'It's a BB unit. One of a kind.' Well why is it one of a kind? Because it was hand built by Ben Solo." That is a very solid argument that is also backed up by her pointing out that BB-8 and Kylo did not interact at all in The Force Awakens. She postulates that the droid will be the catalyst for Kylo Ren's redemption arc in the coming movies. Other circumstantial evidence she provided had to do with Kylo Ren, a ruthless man by all accounts, wanting the droid back unharmed and that the Resistance very likely has a lot of droids at their disposal, so why trust BB-8 with so much? What makes him so special? Well, if Kylo aka Ben Solo had built the droid when he was younger it would have tremendous sentimental value to Han and Leia, both high ranking members of the Resistance. Okay, so what if Kylo Ren built BB-8? While that is kind of a cool theory, it doesn't make it the most shocking potential bit of story for Star Wars that we have heard so far. But we aren't done yet. The craziest evidence for her argument coincides with the much talked about Knights of Ren. In some supposed concept art for the characters (which is shown briefly in the video), it is revealed that there are seven Knights of Ren. She supposes that Kylo Ren built eight humanoid robots who went with Kylo when he turned to the dark side. BB-8 was the only one who did not defect with the other seven, therefore relating to his number of 8. She also cites that Kylo Ren is the "master" of the Knights of Ren, pointing out that C-3PO refers to Luke as "Master Luke." This all strangely makes sense within the confines of the Star Wars universe. Anyone who has seen Jenny Nicholson's videos knows that she generally is just poking fun at these things, even though what she is saying tends to make a lot of sense. Her Suicide Squad Sales Pitch video being the best example. This video was not without its jokes, her admitting in the beginning that the most likely reason BB-8 was so highly featured was to sell merchandise, as well as her joking that BB stands for "Ben Bot." However, the majority of this video is her posting a seemingly logical and legitimate argument for this crazy BB-8 theory, which doesn't seem quite as far-fetched when all of the evidence she presents is looked at. You can check out the full video for yourself below, which may hold the key to one of Star Wars: Episode VIII's biggest secrets.